Click image to read full story and see slide show! Second FirstMed health care clinic for low-income Las Vegans opens. 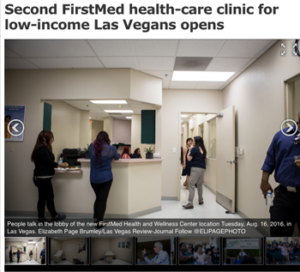 FirstMed Health and Wellness Center, a nonprofit providing discounted health care for low-income and underserved patients, opened its second clinic in Las Vegas. The clinic, located at 400 Shadow Lane, Suite 104, will offer preventative and primary care, behavioral health service and care for youth in crisis, including sexual abuse victims.